A few years ago, I read the following post discussing single-point rubrics from Jennifer Gonzales on her incredible blog Cult of Pedagogy. The post discussed the idea of using a single-point rubric for assessment rather than the multi-point rubrics I was taught to use and how they were not only easier to create, but also offered up an opportunity for students to understand their assessment in a deeper way. Intrigued, we started tinkering with it over the last few years as an English department, developing our process as we went. The other day, I realized that I have never shared that work on here and thought that perhaps if someone had missed Jen’s post or was wondering what this looks like implemented, a blog post may be helpful. So first of all, what does a single-point rubric look like? Here is an example of one we used with an assessment after finishing the book Refugee for The Global Read Aloud. We operate on a 1-4 standards-based assessment system, so the difference between multi-point and single-point is the descriptive language found for each score. Where under a multi-point rubric you would fill in the description for 1 through 4, with a single-point rubric you just focus on what you would expect an at grade-level product to contain. This is what sets it apart in my mind; it allows us to focus on what we are specifically looking for and recognizing that students don’t always fall into the other categorizations that we set, no matter how much we broke them down. This is one of the major reasons why I have loved using single point rubrics; it allows me to leave more meaningful feedback for students when they are either not meeting the grade-level target or are exceeding it. Rather than trying to think of all of the ways a student may not be at grade-level, I can focus on what would place them there assessment-wise and then reflect on when they are not. This has allowed me to leave more meaningful, personalized feedback, while also really breaking down what at grade-level thinking contains. So what is the process for creating one? Determine the standards or learning targets that will be assessed. Students should be a part of this process whether through discussion and creation of the rubric or at the very least seeing and understanding the rubric before anything is turned in, after all, we want students to fully understand what we are trying to discover as far as their learning. Once the standards have been determined, decide what “at grade-level” understanding will contain. While the rubric shown above shows only one box per standard, sometimes our rubrics are broken down further within the standard in order for students to see exactly what it is we are hoping to see from them. (See the example below). Discuss with students if you haven’t done so already. Do they understand what at grade-level understanding looks like and what it contains? Is the rubric a helpful tool for them to take control of their learning? If not, go back to the drawing board with the rubric. Add reflective questions for students so that their voice is heard and further ownership is created over the learning process. This is important because too often assessment is something that is done to students rather than a process that allows students to fully see what they are able to do independently, as well as set goals for what they need to work on. Using the single-point rubric is a breeze for me compared to the multi-point rubric. First of all, it takes less time to create because we really just focus on that “at grade-level” understanding. Secondly, and this is the big one for me, it allows me to deeply reflect on why my gut or the rubric is telling me that a child is not showing “at grade-level” understanding or above it somehow. I have to really think about what it is within their understanding that moves them into a different category. One that is not limited by the few things that I could brainstorm before I saw their work. I then have to formulate that into written or spoken feedback in order to help that child understand how they can continue to grow. This allows our assessment conversations to change from grades to reflection. Discuss it with students before using it the first time. Our students had not seen a rubric like this before and so we took the time to discuss it with them before we used it. This would happen for any assessment rubric, but it took a little bit longer because it looked different. Set the tone for assessment. I have written extensively about my dislike of grades and how I try to shift the focus, and yet I work within a system that tells me I have to assess with numbers attached to it. So there are a few things that need to be in place with the biggest one being the ongoing conversation that assessment is a tool for reflection and not the end of the journey. This is why students always self-assess first in order to reflect on their own journey and what they need from us. This can be messy in the beginning but through the year it gets easier for students to accurately reflect on their own journey and what they need to grow. They then hand that to me in order for me to look at their work and then it culminates in a final discussion if needed. Break it down. It is easy to get caught up in too many things to assess, using the single-point rubric has allowed us to focus in on a few important things. This is important so that students can work on those skills specifically rather than feel overwhelmed by everything within the process. Our students seem to like them, or at least that is what they say. They understand mostly what they are being assessed on and they understand the feedback that is given to them. Having them self-assess and reflect prior to our assessment is also huge as it shows students that they are in charge of their assessment and their growth and that we want them to fully invest in their learning. It gives them an opportunity to see how they are growing and what their next step is before I add my opinion in there. This can also help reduce the “shame” factor that is sometimes associated with grades. When we discuss repeatedly with students that there is nothing wrong with being below grade-level and instead let the assessment guide us to the next steps, it shifts the assessment process, as well as the internalization of grades. Overall, the single-point rubric has been another tool that allows us to help students become more reflective learners, while also helping us get to know the students’ needs more, resulting in a more impactful assessment experience for everyone involved. While we started small, the single-point rubric is now almost exclusively the only type of rubric we use in English and for that I am grateful. If you haven’t tried it yet, I would highly recommend you do. If you have any questions, after all my brain is tired from traveling, please leave them in the comments. While I have tried to move away from giving grades over the last seven years, I have been a failure at it. Those pesky numbers or letters keep popping up in our classroom, whether I want them to or not. That seems to be what happens when you work within a public school system that has made the grading decision for you. For the past seven years, I have written about how to move away from grades, but what if that is not an option? What if grades are a part of your duties and you have to give them no matter what? And let’s face it; assessing students through grades is easy; put a number/letter on it and it tells the whole story for you, or so we think. Put a number/letter on it and surely a child, or a parent, will know exactly what we are communicating and how they are doing. And yet, that is not what happens within most traditional grading; kids don’t know why they get what they get, they feel they have no control, and parents aren’t aware of the full story. I have to come realize that while I can pine for a gradeless system, where we do not place children into such boxes, in the meantime I can work within the confinement currently presented and change the conversation itself. So rather than focus on trying to remove grades completely, I can make sure that the ones I am in charge of giving are actually meaningful, as well as controlled by the students, providing us with another tool for giving the learning back to the students. We start by breaking down our learning targets whenever possible, and while this sounds incredibly formal, it is more of a pointed conversation. What are we learning and why are we learning it are questions that students should be able to answer, even if the answer to why is to be better human beings. Students have a hard time taking ownership over their learning process if they have no clue where they are headed. We then discuss ways to get there. As often as possible, students need have to different pathways to reach their learning goals. While full personalization of product would be lovely, I am not able to provide that for my students at all times. We then look to the five tenets of choice as ways to incorporate more personalization. Students must know themselves. We have two central questions we pursue as an English class all year; who am I as a reader and who am I as a writer? Both of these lead to the self-reflection and discovery that students undertake. After all, I need each child to know themselves well enough to know how they actually need to grow and also to find the motivation to become better. That will not happen if I make the same goal for each child. It is also telling that many of my most resistant learners do not know who they are as learners. How can we expect them to grow if they don’t even know who they are? We know what the end assessment will be. We have to discuss with students and help them understand what our grade level work reads like or presents itself as, otherwise we are asking students to shoot their learning into the dark and hope it sticks somewhere. So actual student examples, modeling, and shared conversations have to be present during our learning as guides to the students. Make it accessible without your direction so they can access it at any time. We change our language. Two years ago I adopted the “Best draft” terminology from Kelly Gallagher and have not looked back. Often students will hand in their “best draft” rather than their final product. Final product means exactly that; final, no need to revise, revisit, or rethink. But “best draft” means that it is unfinished, that there is still work to be done, that even if the assessment is attached to it, it is preliminary at best and can be molded by their own efforts to change their learning product. Students assess themselves first. For big projects, (and I need to do it more) I will not assess it unless a child has first. Otherwise, my voice is what they will conform to rather than their own reflection on where they are on the learning journey. I need them to do the hard thinking work of breaking down their own skills and then seeing what their strengths are and how they need to grow further. They, therefore, need to understand the rubric, the terminology used, as well as how they CAN grow. They come up with a next step. While I focus my feedback on the one next step, they also need to focus on what they are working on next and how else they will grow. It is not enough for them to place themselves into an assessment category and then do nothing about it. Every child needs to set the next step goal for themselves and then come up with a tangible plan to pursue it. This will be a major focus for me next year as I am still trying to figure out how to do this best with teaching 130+ students. They direct their learning. Part of our learning journey is figuring out how they learn best within the confinements of our time, our environment, and the curriculum we do need to explore. So who do they work best and where in the room do they work best are parts of their self-assessments, not just a number or a letter grade. They take ownership over their assessment. While the number (we are standards based) is not the description of them as a learner, it becomes part of our conversation. We must go beyond handing out numbers or letters so that students can understand what it means to create work that is at a “2” or a “3” and then move beyond that even. Making the number or letter something that is in control of the students changes their own classification. No child is a “2” in our classroom, the specific work may be at a “2” level; there is a big difference there. They want more. My students know that their score, which is often selected by themselves, is just a part of their assessment because they are consistently provided with feedback either through a rubric, written out, or a conversation. Very rarely, except for on our spelling packets, are they just given a score with no further explanation. That means that they know that the number is merely a symbol of something larger and not the only designator. They know that there is more to the story. In fact, they get so used to this that if feedback or reflection opportunity is not provided that they ask for further clarification. This is an indicator, in my eyes, that they see how little the actual number/letter symbolizes and need more information. The thing is with grades, they are a tool like any other. It is when we let them dominate our conversation when they become the only thing we discuss that we lose kids in the process. Grades were not meant to be easy, they are meant to be a conversation starter and so it is up to us to start having those conversations if we want students to truly have ownership over their own learning journey. For many years I have disliked grades and how they can affect the learning journey we are on. 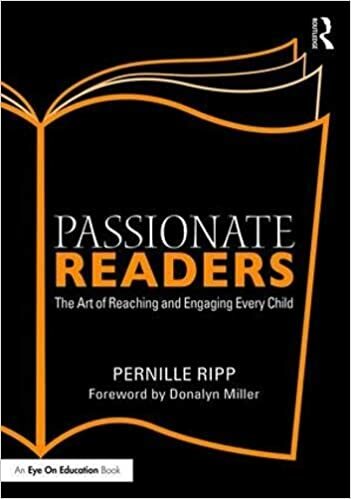 In fact, I have disliked them so much that I dedicated an entire chapter in Passionate Learners about how to go almost grade-less, and yet, I work in a public school district that does do grades. While my district is mostly standards based and rather progressive in its grading policy, the fact of the matter is that I still have to at some point quantify my students’ learning and assign them some sort of a number. No matter how much I detest this very thing. And yet, having this expectation has actually allowed me to really embrace what grades can do for a conversation and how we, once again, can work within the confinements of a system and change the very conversation we are having. One of my largest issues with grades is that it limits the very conversations we have with kids. We end up letting the grades speak for us or we spend time leaving them feedback to only see kids do nothing with it. And who can blame them? If the grade has already been assigned then why should anything be taken to heart? Therefore, I knew that I needed to change the very conversation we were having because I no longer wanted students to just ask how to get an A or a 3, especially in their writing. I no longer wanted them to skip over their feedback and not really grow from it. And while in my elementary classroom I was able to have a lot of time conferring with students, teaching 45-minute English classes meant that I had very little for the one-to-one. And yet, the feedback is so very important because this is what changes the very conversation that we have with our students, especially when it comes to their writing. So what did I change to create more meaningful learning opportunities where students actually used the feedback for something? It is simple really, and I may be the last teacher to have figured this out but figured I would share it still. Students turn in their rough draft a week before their due date. Because my students now turn in their rough draft, I can leave them specific feedback and I also place our rubric in so they can see what they would be assessed at if this were their final draft. They turn it in on a Friday, typically, I have it returned by Monday. I leave them specific feedback, not “fix this…” but instead asking them questions about their writing and pointing out any significant areas of concerns. They then get the next week to revise and resubmit. They get the next week to ask questions. I get the next week to confer with those that need more than just written feedback. Does it work? Yes! As I assess their final writing pieces of the year, I can see just how much they have changed and refined since I left them feedback. I can see how they have actually used the comments I have left them and have figured out how to grow their writing. No more pointless feedback and no more feeling left out of the grading conversation. Is it a lot of work? Yes, I am not going to lie, but it is so worth it when it comes to seeing how they have grown as writers. A bonus is that kids who tend to miss deadlines are now more on track since they know that they need to have a rough draft to turn in. So there you have it, one small idea that goes a long way to give students more ownership not only over their final grades but also over the writing process itself. I think we all are always looking for ways to ease the assessment and feedback process in our classrooms, I know I am! And I get it, giving feedback and doing great assessment with 120 students, or even just 20 students, can seem like an unwieldy beast at times. So while I wrote about lessons I have learned while trying to limit grades, I thought I would also offer up the practical things that have made my day-to-day better. Behold, a few things to maybe make your feedback and assessment process easier. Background: I now work in a district that is doing Standards Based Grades and moving away from letter grades. We also believe that formative work is practice work and can therefore not count toward a summative score, and finally, that students have the right to re-take work. At my middle school, we have a 2 week automatic re-take policy that we encourage students to use in case they need extra help with a concept. They have a notebook that stays in the room. I have learned the hard way that when students leave with their notebooks, they sometimes do not come back with them. So this year, I instead created a readers notebook for them to keep in the classroom. Yes, it was a lot of paper, but it means that my students always know where to write their thoughts, it means that all writing about reading only happens in the classroom, and it also means that I have access to them at all time. This means that not only do we have a routine established for responding to reading, which frees up time, but also that student scan see their thoughts develop over time along with the feedback I give them. Each class has a bin on my shelf for easy access every day and they grab them when they come in before they start their independent reading time. I have pre-printed labels with comments. Not for everything, but when I give feedback in their readers notebooks there are certain things that crop up again and again. That is what the pre-printed labels are for. These change throughout the year and I do not reuse the same ones from unit to unit. It is always catered to what we are working on what I am noticing with the students, and are explained before they are put on their work. The students self-assess before I assess. At the end of unit, before anything is handed back by me, the students will then set goals and reflect on their work. This involves them scoring themselves as far as where they are with their proficiency in the chosen standard. The score is based on a standard they have deconstructed to put into student-friendly language, and also based on a rubric they have built with me or we have discussed. 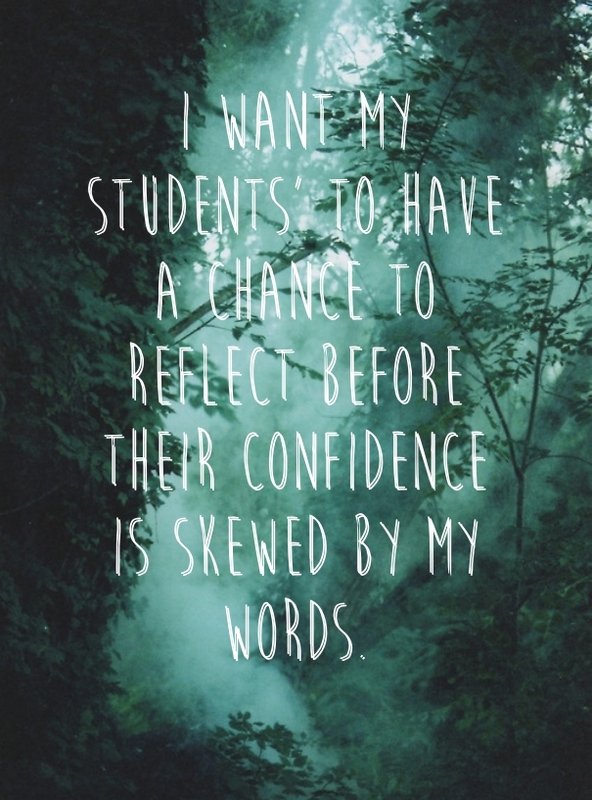 I want my students’ to have a chance to reflect before their confidence is skewed by my words. Standards are assessed twice at least. We have 7 standards to cover in English this year and all of them will be assessed for a summative score at least twice in separate quarters. It is a chance for students to truly see that mastery may come at a different time for them than their peers and that that is ok. It also allows us to establish a baseline score and then see how they grow. When a standard is only assessed once, we assume that all students grow at the same rate, which we know is not true. So instead, make it a point to show students that knowledge is something we gain at all times and that they are the masters of their growth. They have a chance to disagree. Once students have self-assessed, it is my turn. I will either handwrite their assessment or speak to them about it. But even then it is not final, it is a conversation, and students know that this is their chance to speak up. Too often we gloss over the assessment piece by handing things back at the end of class and forget that this is one of the largest opportunities we have for meaningful conversations about their learning journey. Don’t rush through it but take the time to discuss, reflect, and set new goals. All work is kept in the classroom, pretty much. I need to know what my students know. Not what others know, not what they later figured out, but what they know right now. So any kind of summative work is done in the classroom, not at home, so that I can see how they work on a product with time management and the need for them to think deeper. This also fits into my policy of limited homework. And it forced me to evaluate what I am asking them to do, since I can see how much time something takes. ( I also do all of the work my students have to do, which has definitely been an eye-opening experience). 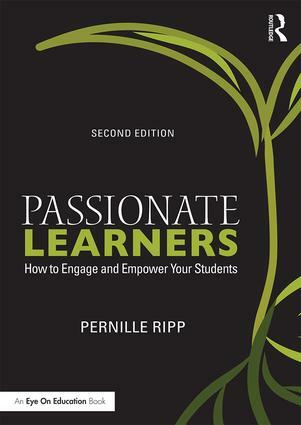 PS: For the how-to for eliminating or limiting grades, please consider reading my book Passionate Learners. There is a whole chapter dedicated to not just the why, but the actual how. I have been trying to create more meaningful assessment for the past 5 years. Not a small feat if you would, especially now when I am teaching more than 120 students. Yet, a few things I have realized over the years may help others as they try to move away from grades as an end point, and instead move into better assessment and feedback, where students actually feel like they are in charge of their own learning journey. I am not the only one assessing. Students self-assess on almost every assignment once we get started. This is important, because they should not always be looking to me for how they did. They need to know themselves well enough to reflect on their own performance. It is an ongoing conversation. We take the time to deconstruct the standards and rewrite them in student language. We take the time to go through what an assignment is actually asking them to do. We take the time to plan together so students can get ownership over what they are doing. Assessment is not something that only happens once in a while so it should not just be discussed once in a while. I cannot assume. Too often we assume as teachers that we know what a child is doing or thinking. It is not accurate most of the time. So instead, I ask a child what they meant, I ask them to explain it to me as if I was not in the room. I ask them to make sure that I can understand their thinking at all times. We seem to focus too much on brevity, I would rather have a child be able to explain the full extent of their thinking than assume I know what they mean. They need to produce more than I can assess. Our job is not to assess every single thing that a child produces, but instead to assess the pieces they feel are worth others looking at. Asking students to evaluate their work and only submit the one piece from a unit that they feel will show off their knowledge the best? That is an assessment in itself. They need to assess each other, but not until they trust each other. We love using students as peer editors, as peer reviewers, and even as peer assessors. However this can be incredibly hard for students who do not trust one another. So wait. Let them build community first. Let them choose the people who will see their work. Do not force them into vulnerability, it is not worth it in the end. Assessment needs to happen in class. They need to take ownership of the whole process, not just the end result, so that means that we are constantly evaluating our work, we are constantly engaged with our work, and we are doing it in class, not at home, not with parents. But here, now, this day, so that the conversations can happen as a group, as a partnership and as a self-reflection. And so the conversation can mean something and not just be homework or something else to get through. 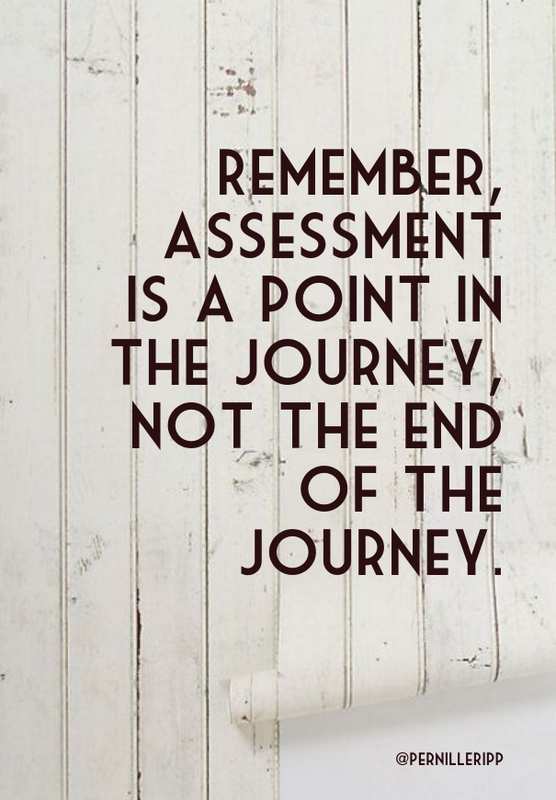 Finally, assessment is a point in the journey, not the end of the journey. And students don’t often understand that. We have to have these conversations with them in order to change their mindset. If students think that grades are something being done to them, that grades are out of their control and do not happen until the end when it is too late to do anything about it, then we are missing the whole point of assessment. Assessment is for bettering yourself, for deepening your understanding, for helping you set goals. Not for completing something so you can cross it off the to-do list. Once again, I am reminded of the saying; We do not teach standards, we teach kids. And that is painfully apparent in the way we use assessment, feedback, and grades in our classrooms.